I don’t know about you, but I’m beyond fed up with all the whining and complaining by people who’ve discovered they cannot control every decision Governor Palin makes. There are people out there who would throw a hissy fit if they suggested she go to the Bahamas for vacation but instead she opted to go to Italy. It’s just that crazy right now. We are all aware, for example, of the conniptions some professed supporters are having over her endorsements. When did Governor Palin put up a suggestion box like you see at the local library? When did she issue a Facebook note that said, “Tell me what I should think”? 1. People say of her, “She is average-America. She is just like me. I can relate to her.” Because she is so much “like us,” people actually begin to think that they can dictate what move she should make next. Somehow they have failed to realize that being “one of us” means she has a quality that each of us values: independence of thought. 2. As a Black conservative, I see a parallel between the reaction to Black conservatives and the reaction to Governor Palin. Some people treat the governor the same way some Black Democrats treat conservative Blacks such as myself. That is, they love you as long as you subscribe to their big government, leftist agenda, as long as you remain “one of them.” They respect you until you step out and do your own thing, like think for yourself in a manner that doesn’t jive with their thinking. Then you’re labeled a “sell-out.” Then you’d better be prepared for some to shun you, insult you, and question your identity, simply because you have the audacity to step away from the system they thought they had you locked into. They thought they owned you; realizing they don’t throws them into a frenzy–and they actually feel betrayed. People who respond in this manner don’t appreciate independent, principled people. No, they want puppets on a string or slaves on a plantation. Whether they coin you a “sell-out” or a “RINO,” the desire is the same: to enslave and control. The tactic won’t work on me, and it won’t work on Governor Palin. Read Dan’s full enlightening article here. Sarah Palin signed her best selling book at the Books-a-Million at the Volusia Mall today, making her second public appearance in the Daytona Beach area. Palin attended yesterday’s Daytona 500, drawing huge applause from the throngs of NASCAR fans and she’ll speak tonight at the $150-a-plate dinner for the Daytona Regional Chamber. The book signing drew 900 people, with the line extending outside and snaking through the store. One of the most photographed fans was Debbie Cavalier, a Ponce Inlet woman who won several Palin look-alike contests during Halloween. “My niece told me that I look like her,” said Cavalier, who developed the complete look, from the teased hair and the crisp bright suits, to the high heels. Cavalier said that Palin loved her outfit. “She said, ‘We’re looking in the mirror,’ ” Cavalier said. And Daytona 500 fan Tony Maggio, from Weymouth, Mass., rounded out his annual trip to Daytona by getting his copy of Going Rogue signed. Maggio had waited outside the store last week at 5 a.m. Friday and snagged bracelet number 5. “She was so nice, so pleasant. She’s so much more beautiful in person than on TV,” Maggio said. 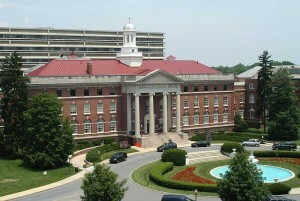 As a retired flag officer, I often have the privilege of visiting with our wounded and their families and so I commit some time and money, donating so far 100% of the book royalties to the USO Metro DC Hospital Services Fund for our wounded warriors at Walter Reed Army Medical Center and Bethesda National Naval Medical Center. Military men and women are nimble, used to changed plans, and the governor is a woman who knows what is important and accordingly makes on-the-fly course corrections as well. She upended her Sunday calendar, postponing a book event in Iowa, so that she could see our wounded at Walter Reed. She blew into the foyer at Walter Reed with her father, mother, aunt, husband and infant son, and she was quickly in Soldiers’ rooms, sitting with them, hugging the wounded, chatting with the families, holding the children, signing her books, giving away every ounce of energy she had in every room. I was impressed. At some point in time the President of the USO put her finger in my chest and said, “Tony go get your book, the troops are asking about it.” [US for Palin Note: book is Sudden Threat ] It had been some months since I had walked through the hospital and I didn’t want to latch onto the Palin event, but I tend to do what Elaine Rogers tells me to do, so I cycled back, dumped a bunch of books on the cart and went into rooms the governor had already visited. Read the rest of General Tata’s piece here. When I was a child, the American pioneers who tamed the West were among my heroes. But, I “knew” that they were a breed that disappeared 150 years ago. I know now, that I was wrong. We have a living pioneer among us…and I would later learn that most Alaskans are in fact, living pioneers. More to the point, Governor Palin does not just speak about working with a servant’s heart, she puts those words into action. 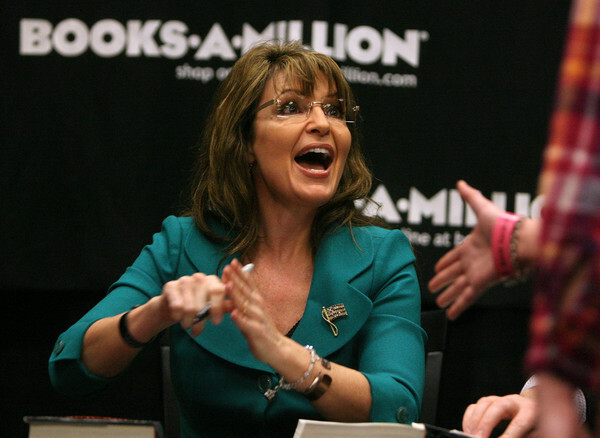 Governor Palin had a book signing stop that next morning, which she postponed, leading to a cascading effect in the rest of her schedule. Further, she did arrive to that signing late and attributed her lateness to the weather. She could have taken a the convenient path, or beat her chest about what a great person she was for visiting Walter Reed, but that’s not what a Commander-in-Chief in waiting does — and that’s not what she does. She genuinely cares for our troops. Her actions prove it. She has raised $120K for our troops in 2009 via charity auctions. Her book tour stopped at four military bases and royalties from the sales of books at these venues went straight to military charities. Track Palin chose military and on September 11, 2008, his mother — Gov. Palin — presided over the deployment ceremony of which he was a part, as he went to serve a tour of duty in Iraq. Leading by example: Governor Palin in a cafeteria with troops in Germany (2007). One of the core principles of Transformational Leadership is Leadership by Example, and this is how Governor Palin has always led — by example. She walks the walks and holds herself accountable. My entry Presidential Leadership discusses Governor Palin’s superior Commander-in-Chief skills at length.